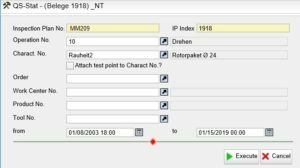 By Matthias Kohlbrand In A inspection plan defines the features or attributes of a inspection object that need to be tested. If manual inspection is required (inspection order), Cosmino ProControl indicates the features to be tested to the examiner and requests the recording. All already measured so-called result data can now be exported directly from the web interface of inspection planning into a DFQ file. DFQ is a standard format with which the values can be transferred into systems for further analysis, for example into qs-STAT®. The DFQ export can be activated for a test plan or a inspection plan workplan directly using the right mouse button. For the latter, the export is then already pre-filtered to the result data of this workplan. By selection, the data to be exported can further be limited to workplans, features, manufacturing orders, workplaces, test objects and the evaluation period. Fat Client users are still familiar with the function, which is now also available to the Thin Client with the current Cosmino update.